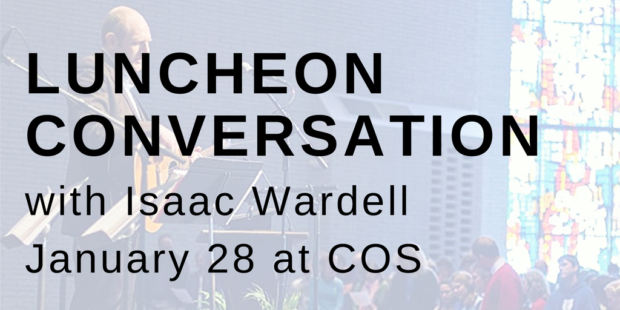 The CoS faith formation, worship, and anti-racism teams cordially invite you to a luncheon conversation with Isaac Wardell on Sunday January 28, 2018 following the morning worship service. The conversation will center on the topics of anti-racism, lament, and vocation as expressed through Christian worship practices. Isaac will offer a testimony of how his church in Charlottesville responded to the Unite the Right rally and related protests during August of 2017 and how the congregation has worked to embody a posture of biblical lament within their worship services during the past year. Isaac Wardell is the director of worship and arts at Trinity Presbyterian Church in Charlottesville, Virginia and most recently launched Porters Gate Worship Project, “a sacred arts collective created to identify with and fulfill the most impactful role of the Christian Church: to be its porter, one who looks beyond church doors for guests to welcome.” The collective recorded and released a musical album entitled Work Songs comprised of songs that affirm the day-to-day Monday through Friday vocations of the body of Christ. Read more about Porters Gate Worship project at https://www.portersgateworship.com/about.